The 6th day in Jakarta evinced a quality start for the Indians as they won their 6th Gold. Rohan Bopanna and Divij Sharan vanquished Alekzandr Bublik-Denis Yevseyev of Kazakhstan by winning the first and second set by a margin of 6-3 and 6-4 in the men’s doubles final. They remained compact and were furious with their attacking strategy. Divij currently holds rank no. 36 in men’s doubles and boasts rank 3 at the Australian Open. Previously at Icheon on 2014 Asian Games, Divij won the bronze medal for India with Yuki Bhambri. 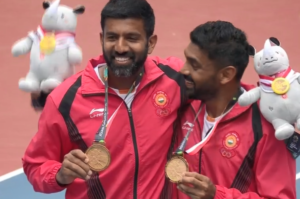 Whereas, Rohan Bopanna currently ranks at 19 in men’s doubles and won the 2017 French Open – Mixed Doubles title with Gabriela Dabrowski of Canada becoming the fourth Indian player to win a Grand Slam title which has been a major boost to partner with a talented teammate and attain the highest rank at the Asian Games 2018. Next articlePhotos: The Maya Reis Gabeira Story. POLL ALERT – Australia vs India 2nd Test match! !